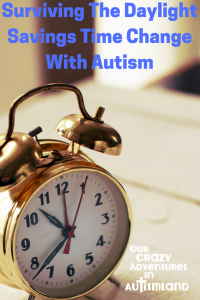 Surviving the daylight savings time change with autism is equivalent to getting your nails pulled off with pliers. That may be a little over dramatic but it is so true. Time changes are tough on kids period. Adding in autism gives you a recipe for disaster. The fact that most people have to deal with this atrocity every Spring and Fall makes it imperative that you have a plan in place. I can say with some amount of smug satisfaction that thanks to our recent move across the country to Arizona, we no longer have this problem. Arizona likes to be a rebel and not participate in the daylight savings time fiasco. With that in mind, adjusting to the time change from Eastern to Mountain (which was really Pacific until November) was BRUTAL. Logan’s body was telling him one thing but the time was telling him something else. The sun went down at a crazy hour (we live in the valley in between 2 mountains) , it came up at weird hours, etc. It was definitely a learning experience. 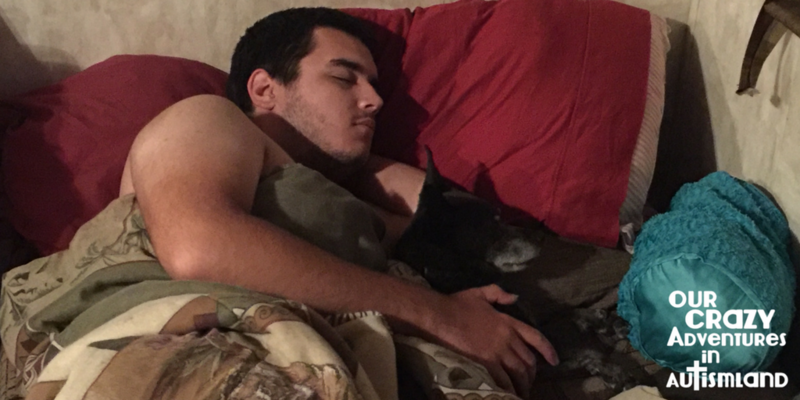 Once we got settled, there were a few things I did to help him (and the rest of the family) adjust to the new times. I must make the confession that this took weeks to accomplish. You will be in such a better place on the day of the time change if you make some accommodations in the weeks leading up to it. Just like with everything in autism, it takes a bit for our kids to adjust to the change. Begin adjusting their bedtime in increments a few weeks ahead. If it’s spring forward time then decrease the time they stay up until you get there ahead of the day. If it’s fall back then increase the time. You get the idea here. Even if it’s in 5-minute increments, start the adjustment. Change the clocks in your house to the new time the week beforehand. If your child wants to know what time you need to be somewhere then tell them the adjusted time. Of course, keep a clock (your phone, for example) with the correct time so you don’t get somewhere too early or too late. When Logan got old enough for his own phone, we simply explained the time change was approaching so we were adjusting. Add in extra Vitamin D if the time change is to fall back. You get less sunshine in the winter, therefore you get less access to Vitamin D. Studies have shown that increasing your Vitamin D in the winter will ward off depression, among other things. Another way to do this is to be sure that everyone gets outside for a half hour or so during daylight hours. This is not an easy feat, though, if you live where winter is brutal. Take a nap if needed. This isn’t always convenient or easy but if you or your child want to nap, then, by all means, do it. It’s not forever. Rest when your body is tired. Don’t schedule unnecessary activities for a week or two after the time change. Seriously, just say no. If pressed for an answer, look them in the eye and say “autism.” If they belong to your tribe, they’ll understand. If they don’t understand, they don’t belong in your tribe. Keep to your regular schedule with just the necessities. Above all, give you and your family lots and lots of grace. Schedule adjustments are hard for everyone. Remind yourself that this too shall pass relatively quickly. Minimize your schedule and choose rest for a bit. No one remembers the time change, but they do remember your response to it. I’m not saying they have to be amazing memories. Memories of just surviving it are ok too. Oh, you are so lucky! I am dreading the time change. Thanks so much for the tips.